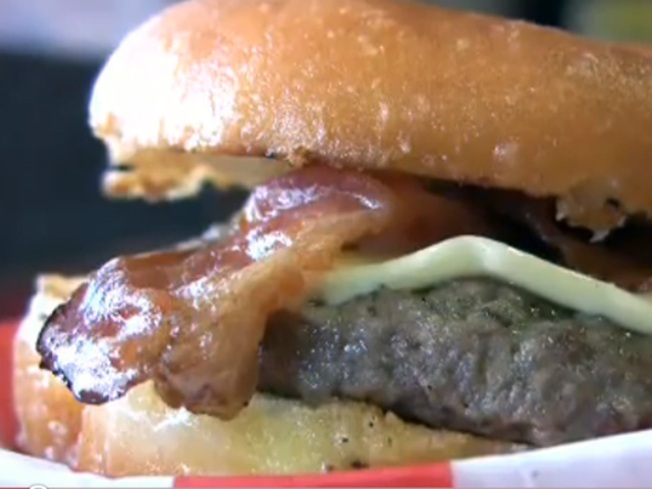 A donut, a burger, cheese and bacon. The moment your stomach has been waiting for -- or in fear of -- is here, The Big E started on Friday. Since this is a fair, many of the most popular items are fried. There is deep fried butter -- regular or garlic -- and there are Fried Snickers, fried chocolate chip cookie dough bits and . The culinary experience will include sweet, gooey fried jellybeans this year. And,in tribute to Elvis, who died 33 years, there are fried peanut butter and banana sandwiches. The old standbys will still be on the menu -- like The Big E Cream Puff, Éclair and the huge baked potato. There’s also a Big E Martini Bar, for those over 21, and Frozen Hot Chocolate for anyone who likes things that taste good. If you haven’t tried the Craz-E Burger, this is a 1,500 calorie adventure in food: a bacon cheeseburger on a grilled, glazed donut. You can see the video of the burger here.